Northwatch Keep is a medium-sized military fort in northwest Haafingar, to the west of Fort Hraggstad. 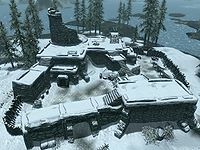 The fort is used as a jail by the Thalmor. It has a courtyard and one interior zone: Northwatch Keep. 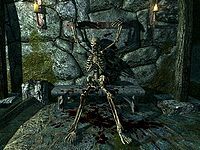 The fort is off-limits to anyone except the Thalmor; ignoring the warnings to stay away will result in the patrolling guards becoming hostile. If you ask the Northwatch guard at the front entrance for details of the Keep, he will curtly reply, "You have no business here, so keep walking." and, "That's privileged information. Now move along." There are two entrances to the courtyard, with two entrances to the interior of the fort. The main entrance is guarded by one Northwatch guard and is unlocked. There are two archery targets to the left of this entrance. Three more guards patrol the grounds, and three Northwatch archers patrol the walkways above; they all turn hostile when you trespass on the grounds. One guard is leaning by the door, another in the camp to the left of the rear entrance, and the third is working the forge near the camp. There is one archer standing on the battlements above the first guard, and the other two are patrolling the walkways. There is a back gate to the keep and rear entrance, which is master locked, both situated by the forge. There is a campfire on the walkways above near a lookout platform. There are three lean-tos with unowned bedrolls near the forge, and a table opposite the locked entrance, with a random one-handed weapon on top. Several barrels can be found within the courtyard, three snowberry bushes around the forge and locked entrance and a wood chopping block to the right of the lean-tos. Through the unlocked front door is a small room with two weapon plaques on the east wall holding two steel maces. Ahead is a flight of stairs that descends into a circular room with a guard and a Northwatch mage sitting at a table. There is a bottle of wine among several empty wine bottles on the table top and two open crates stacked beside the table are full of more empty bottles. There is an unlocked chest on the other side of the table from the entrance and two cupboards against the walls, these hold two food sacks, a gourd, three bulbs of garlic, a single loose septim, a set of fine clothes and a pair of boots on their shelves. On the far side of the room is an antechamber with a set of shelves on the left holding eight common books and a wooden door ahead. Through the door is a passage that descends a further two flights of stairs, passing some barrels on the right, before entering another passage with a wooden table on your left, with a woodcutters axe on top and another to the right beside an unusable wooden block. The passage continues to the east, where it descends another long flight of stairs; at the bottom is an archer. Any noise when dealing with the archers will alert a guard and a mage in the next room. The next room is used as a bar, and contains a guard and mage, unless they have already converged on you; one is sitting at a table and the other is behind the bar. There are three small tables in the barroom, with a flute, several loaves of bread, and cheese, a joint of raw beef, and a bottle of wine on top of them. Against the west wall is a stack of barrels, two of which contain bottles of Nord mead. To the right of these is a weapon plaque holding a steel sword. In the northeastern corner is a bar with five bottles of Nord mead, a bottle of wine and an apple pie on the counter and two bottles of alto wine, five bottles of Nord mead, two bottles of wine and a copy of the One-handed skill book 2920, Morning Star, v1 on the shelves behind the counter. There is a passage to the north, that passes more barrels and after a couple of turns opens into another passage heading west, with a cart on your right containing a dead bandit. The passage leads into a two-leveled room, with a guard to your left standing in front of a door, two archers on the upper level; one of which is patrolling up and down. Any fighting will alert a mage who will emerge through the door on the left and who favors shock spells. This can be a challenging battle for the unaware. Through the doors on the left is an L-shaped room with crates stacked up against the south, one of which has a copy of the Two-handed skill book The Legendary Sancre Tor. Beside this is a table and chair with a joint of raw beef and a bottle of Nord mead on top. At the far end of the room is a large king-sized bed with a set of shelves and a single weapon rack holding a random one-handed weapon to the left. On the shelves are a knapsack and iron mace. The mage is carrying a copy of the Northwatch Captain's key. The stairs to the upper level are against the north wall. At the top of the stairs is a cart containing an empty burnt corpse and along the wall are weapons plaques holding a steel sword and mace. To the left are two tables with a bottle of wine on top and empty bottles of wine on and around them. There is an unlocked chest to the left of a passage heading west from this level. The passage takes a couple of turns before leading to a T-junction in a wider passage with crates on either side. There is a guard sitting at a table to the right. On the table is a pickaxe, a baked potato and a leveled dagger. Opposite this is a row of five weapon racks holding a selection of low quality weapons. There is a lit brazier at the junction with a woodcutter's axe beside an unusable wooden block. To the left at the junction is a torture room with various torture equipment including racks and a heated iron sat in coals. There is a Northwatch interrogator, who carries the Northwatch Keep key, which unlocks the back door and who will be alerted by any fighting nearby and converge on you. In the room is an unlocked chest, a table with a bulb of garlic on top, four common books on a small unit, a set of shelves holding a random poison and troll skull and two weapon racks on the wall that may hold a random weapon. Thorald Gray-Mane can be found shackled to the north wall between a table covered with blood with two iron daggers and a steel dagger on top and a set of shelves holding a random potion of healing and one of magicka. As you approach he will ask, "You there, what are you doing?" You will need to speak to him in order to release him. Beside the table to the right of the junction is a wooden door that opens into a long passage with two cells on either side and two guards patrolling up and down, who may be alerted to any fighting and converge on you in the previous passage. There are two levers on the left at the start of the passage that open the cells, each of which is master locked and can be lockpicked. Three of the cells are occupied with prisoners; however, they do not try to escape when released. At the far end is a table with a salmon steak, Nord mead and loaf of bread on top. Around the corner is a flight of stairs leading up with two stacked, open crates filled with empty wine bottles and a cart containing roughspun tunic, ragged trousers and footwraps either side of the bottom. At the top of the stairs is a final room containing two sets of shelves holding two bottles of ale, an iron dagger, nine common books and three food sacks. Opposite the stairs in the master locked door that leads outside by the forge and can be opened using the Northwatch Keep key. If the entire fort is cleared prior to the quest Missing In Action, only the inside of the fort will be reset when the quest progresses to the objectives in which you are required to save Thorald. This page was last modified on 16 April 2019, at 11:04.